I have two network cards on my computer but when I want to set the network that i want to follow, I have a problem: I selected "only networks below", the 2 MAC addresses of my 2 cards are visible, only one is green, but the 2 cards are activated and used. Of course, if I select the grayed one, Networx does not work and vice versa. If I disable the network card whose MAC address is green, the gray turn to green and becomes operational. You can imagine that if I write in this forum, it means that I would like to set on Networx with the gray one, without disabling my second card. Those MAC addresses are not the MAC addresses of the cards. 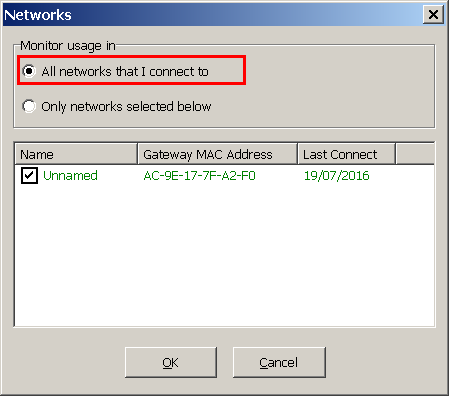 They are the MAC addresses of the default gateway to which the PC is connected. As far as I remember, in this feature NetWorx recognises only one connection. Can't you just tick both networks? Then NetWorx would be active no matter which one is connected. Sorry, I wrote a small error: the MAC addresses are those of the two gateways I'm using. I can tick the one I want, but if it's the gray one, the Networx's thumbnail turn to gray too. I don't understand why the two networks are working but only one is available. OK, maybe Networx works with only one network at a time. In this case, how can I choose the one I want?